Don't get frustrated furthermore looking for a glass to get you through the night. Fragile Alert at Your Fingertips: You don't have to go spelunking for glasses inside the depths of your cabinets. Each Rail's Dimensions: 11" x 1.75" x 0.75"
Versatile: Made with good craftsmanship this stemware rack is well-made and crafty, your precious wine glasses can be easily reached and you'll be able to set the table a lot faster than usual for dinner time. Inexpensive: This wooden stemware rail is designed to keep you satisfied for years to come, you can satisfy your bank account and your kitchen cabinets. You'll be able to work more productively in an organized kitchen, so help yourself feel like a gourmet cook. Space Saver: The functional design makes it easier for you to store your stemware with ease, you don't have to leave extra room in your cabinets, the adjustable design is great for even storing your large wine or martini glasses, with both sections you can store up to 6 large glasses. 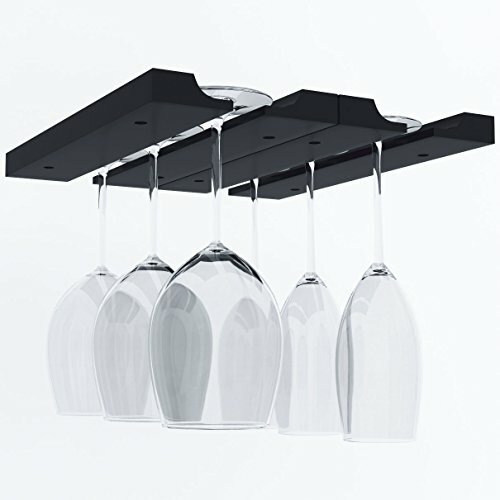 No Fuss Assembly: This under cabinet wine glass holder consists of 2 11-inch long rails with 2 adjustable slots and with the mounting screws and anchors included in the packaging you can save yourself a trip to the hardware store. The assembly will be breeze, you don't have to hire a professional to install this organizer for you. If you have any questions about this product by ArtifactDesign, contact us by completing and submitting the form below. If you are looking for a specif part number, please include it with your message.